There isn't any "right" time to build the Rumford fireplaces. Masonry fireplaces are sort of independent of the framing. 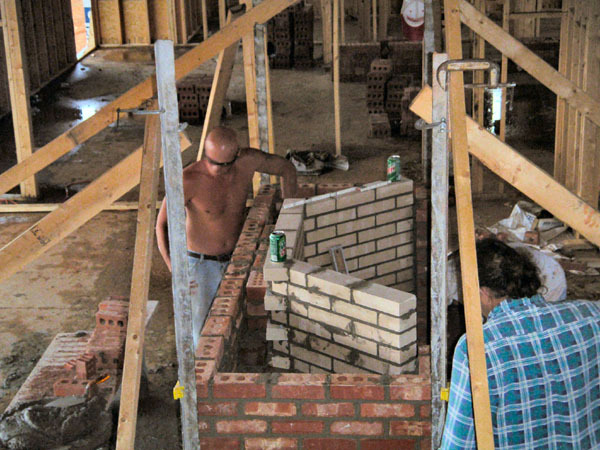 In most of the country the masonry fireplace goes in right after the framing but before roofing and finish work. Sometimes that's a narrow window. If the masons are there later when the roof is on and the finish carpentry, flooring, plaster and windows are going in it's more complicated but often masons like to schedule their work after the building is covered and they can work inside out of the weather. The finishers, however, don't much appreciate the masons tracking things up and dragging rebar across the window sills. And, of course, the masons have to work around all the other workmen and materials in the way. In the Southwest all the masonry work is done before the framers show up. That allows the masons to be in and out before the jobsite gets complicated. Whatever you do it's important to communicate. The builder needs to know when to expect the mason. The mason needs to understand when the builder wants him on the job. When the mason builds the fireplace may depend on weather, local tradition or other factors. Masonry fireplaces are sort of independent of the framing. I am coordinating the building of 3 Rumford fireplaces on the Oregon coast. I am getting inconsistant sequencing information from the masons I've contacted. Could you tell me the industry standard or recommended sequence when building Rumfords on an interior wall with totally new construction and how much framing if any needs to be done before they are built? I don't know that there is any "right" time to build the Rumford fireplaces. Maybe it would be useful to ask your various mason contenders to explain why they prefer the sequencing they advocate. And I'm not entirely sure I understand the problem nor what you mean by "framing". A Rumford in a masonry enclosure is sort of independent of the framing if you mean the wood or steel framing of the walls of the surrounding house. I've worked on jobs in the Southwest where all the masonry work is done before the framers show up. That allows the masons to be in and out before the jobsite gets complicated. If the masons are there later when the roof is on and the finish carpentry, flooring, plaster and windows are going in it's more complicated but often masons like to schedule their work after the building is covered and they can work inside out of the weather. The finishers, however, don't much appreciate the masons tracking things up and dragging rebar across the window sills. And, of course, the masons have to work around all the other workmen and materials in the way. In practice, due to scheduling and weather, the fireplace often is built under any of the above scenarios. As I said, a masonry fireplace is sort of independent of the framing.